Foot Therapy presents Love to the world, a party raising money for the Gaskell Garden Project. 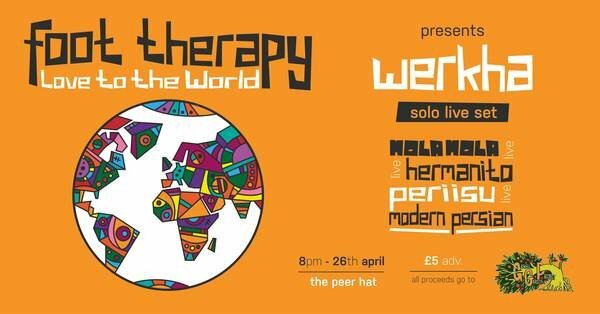 We are back for our second Manchester party, bringing a diverse line up of superb local talent to the Peer Hat basement. Werkha, is Tom A. Leah, a Manchester musician and producer who blends of jazz, broken beats, house, hip hop and more through live instrumentation, band arrangement, electronic production, DJ and remix work. Signed to iconic label Tru Thoughts, Werkha’s releases over more than six years have been consistently excellent, showcasing that rare blend of musicality and technical expertise that signifies an authentic talent. Recently Werkha has dedicated time to performing and developing his live shows, taking his musicianship to the next level. He joins us with a solo live set that’s guaranteed to bring vibes. Hermanito blends sampled sounds from around the world to create a unique hip-hop style. His live sets are full of emotion and melody with some unexpected turns, whilst staying rooted in funky head-nodding rhythms. A brand new live band and production team, Mola Mola are ones to watch to watch in Manchester. Combining influences of neo-soul, jazz and disco with some brilliant songwriting, the Mola Mola live band show is not to be missed! Manchester based electronic artist PERiiSU is a producer of gritty electronic music with soulful and smooth elements. We are very excited to be welcoming this very talented producer to the Peer Hat. Joining us on the 1’s and 2’s is Manchester DJ Modern Persian who will be bringing the heat and warming up the dance, showcasing divers musical styles. Foot Therapy DJ’s are couple Bryan Tomson and Maggy Hopson aka DJ Black Pepper. Inspired by a shared love of record collecting and silly dancing, we started Foot Therapy in spring 2018. Our musical ethos explores the diversity of dance music of black heritage with a grounding in house music but veering into disco, garage, jungle and African rhythms. The concept behind Foot Therapy is to create a welcoming atmosphere for dancing with no egos or pretension. The night features bespoke live visuals from Foot Therapy resident VJ Dee Dixon aka DeDe, who has recently provide visuals for Ad Hoc records nights, Floating Points and more! 100% of proceeds from the event will be donated directly to the Gaskell Garden Project, who are an environmental and social justice project based in Manchester. As well as workshops on permaculture and environmental sustainability, the group provide amazing support and sponsorship for refugees and asylum seekers. With the current hostile environment most recently demonstrated with the unlawful deportations to Jamaica, we believe GGP’s work is more vital than ever, and we know that all money we can raise will help grow the project and directly benefit those in our city who need it the most. We’ll be kicking things off early so get down from 8pm, partying on until 3.30, We hope you can join us for what is going to be a really special night.